My first exposure to a project-based lab class, everything we learned was applied in some way through our three major team projects. Interesting fact: The class was part of a study comparing project-based learning to lecture-based and the conclusion was that project-based students retain more information than their lecture-based counterparts. For more specific MatSci information, visit Jon Stolk's website. 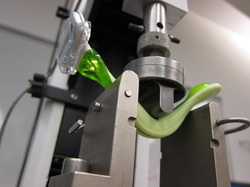 My project investigated the chemical structure and material selection of common disposable razors. My team and I wanted to observe the differences, if any, between the razors' handles and their price range. Additionally, we ran tests on the blades to see if they had any special coatings and found that the Gillette razors had a layer of what we suspected to be Teflon. (Teflon and water reacts with each other, dulling the blade faster than a typical non-coated razor.) Through a battery of tests, we discovered that the polymer in all the razor handles tested was really styrene, not polypropylene, a much weaker and less durable plastic. This was a great experience because we got to learn how to use the Differential Scanning Calorimeter (DSC), Scanning Electron Microscope (SEM), Fourier Transform Infrared Spectroscopy (FTIR), and Instron machines. For this project, my team and I wanted to study the properties of silver, particularly the alloys used in jewelry that are formed between copper and silver (sterling silver has about 8% copper in it). Using cast ingots that we found with certain percentages of silver and copper, we had to grind down these edges and test them in the X-ray Fluoresence (XRF) to determine how much of each sample to add to reach our particular concentration of silver alloy that had about 12% copper in it. At 12%, copper and silver are somewhat stuck in an unusual phase. However the XRF machine we used was imprecise and gave us slightly higher percentages of copper. We had thought we found our perfect alloy, only to realize that we had made sterling silver instead (which is about 9% copper). Due to the fairly random alignment of silver and copper atoms, we wanted to see how the strength of our alloy changed as we put it through a casting process and a forging process. Forging forces the atoms closer together and results in a stronger and more durable ring. However, it is harder to pound in fine details and in the end we decided that there wasn't much of a difference between the hardness of a cast ring vs. a forged ring for most jewelry wearers. For this project we were forced to ask ourselves, what is a modern material, and what can we prove with it? My team focused on Silly Putty, a common children's toy that is a simple and basic silicone. 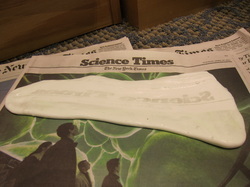 We made our version with some Elmer's glue and borax. By modifying the amount of borax we were able to determine that the concentration of borax made the most brittle or rubber-like silly putty. The greater the borax, the more brittle the silly putty (to a point). When dissolved, Borax makes the polymers in Elmer's glue form more bonds between each other. We compared samples at different temperatures and also measured how high each sample bounced. Generally the colder the sample, the higher it bounced. This makes sense because the molecules would be packed closer together.